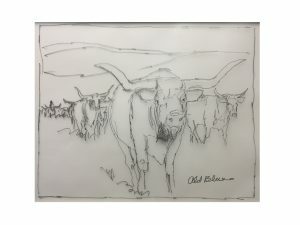 Old Blue was a Texas Longhorn steer. He was only three years old when he led his first cattle drive to Dodge City, Kansas. A copper bell hung around his neck. 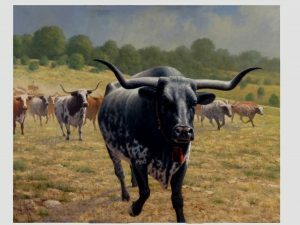 The herd would fall in behind his long stride following the clanging bell. For eight years he led drives into Kansas. He became a fond pet of the cowboys, visiting the campsite for handouts, many times sleeping near the chuck wagon. His last days were spent in retirement at the JA Ranch, petted, honored and admired. Old Blue lived to be 20 years old. This piece went through many changes. The background was altered to include trees and a slope to give more movement to the composition. Old Blue was reduced in size and thinned down to look more like the longhorns of old. The longhorns in the background were pushed back to give him more of a leadership quality. A cowboy and cows coming down the hill were added to suggest a larger herd. Old Blue was given a pose of walking.